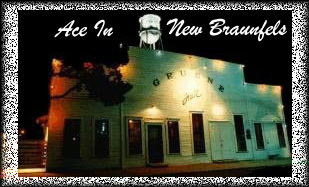 Greune Texas has become quite the happening place in the last 20 years. Nothing like a night at Greune starting with a great steak dinner overlooking the Guadalupe River and a few cold ones at the Grist Mill. The General Store is a great little experience. A lot of cool Texas stuff. They have just put up a new bridge down by the river after all these years. And a lot of new tubing places. Theres nothing like a day tubing downs the Guadalupe, especially when you were in your 20's. Oh, the memories! Yes, Gruene Hall! Claims to be the oldest dance hall in Texas. I believe it was something like 1896. A small German square with a dance hall and a few houses and a few brick buildings. (in the early days, now it is commercialized.) This place brings back to me the best of early Ace memories. If you have never been there, you need to go, regardless of who might be playing there. I can't count the times I saw Ace play here. I am sure it was close to 30 or 40. A lot of the shows they played were with Clay Blaker (who you know wrote some of George's early songs) Each band would play a set and then for the final set they would all get on stage and jam. It was great!Certainly worth the price of the concert tickets! Gruene Hall is great because there is no ac and no heat. The way you keep warm is drink a shot of wild turkey. You see more dance styles here than at any other place in the world. The courtyard in the back is great where during breaks you can go outside and pitch horseshoes are cool off during the summer. They had the big 4 foot floor fans in the corner of the dance floor in the summer so you wouldn't pass out going around the dance floor. What really looked great was at the end of the night. The waitresses never picked up the long neck bottles on the tables during the night. There were hundreds of longnecks lining the tables. I believe there is a picture of this on the back of Georges first album. The Chandelier now sits as a vacant shell on the side of the road on the north side of New Braunfels. This was a step up for "Ace". 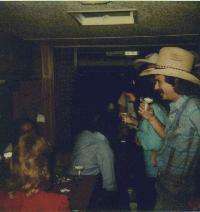 Only a couple of mile from Greune Hall it was a club fashioned for the new popularity of country music. It had a BIG DANCE FLOOR! One of the best dance floors in any club I saw Ace play at. Even with a big crowd you could enjoy a great dance here. Backstage was basically outside. There was a small room offstage, and then the door to outside where they parked the first bus Ace had. The picture below is from inside this bus outside the club, celebrating George's first # 1 single. Now just for a little fun, I have posted links to the Geeksterman's youtube video's. Although he is know to be a little creepy and inspire nightmares. I think he is a funny guy! Purgatory road is about a 8 to 10 mile stretch of road running between highway 306 to Ranch Road 12 to San Marcos & Wimberley. This is the darkest road I have ever driven. It has curves, dips, bumps and hills. Perfect for driving your newly bought sports car on. My brother told me about a game him and the band members played. Playing hide n seek in the cars on this road coming back from Greune Hall. You would get in the lead and go as fast as you could and pull over and turn off your lights, then wait for the other guys to go by. Then appear behind them and turn on your lights again. It sounded like fun, so a few of my friends and I tried it on several times. Although dangerous and foolish, it was quite a rush! Going anywhere from 60 to 90 miles an hour. The best night was when there was an electrical storm. This was the best and scariest lightning display I have ever seen! Anyway, just a side story I thought you might like.